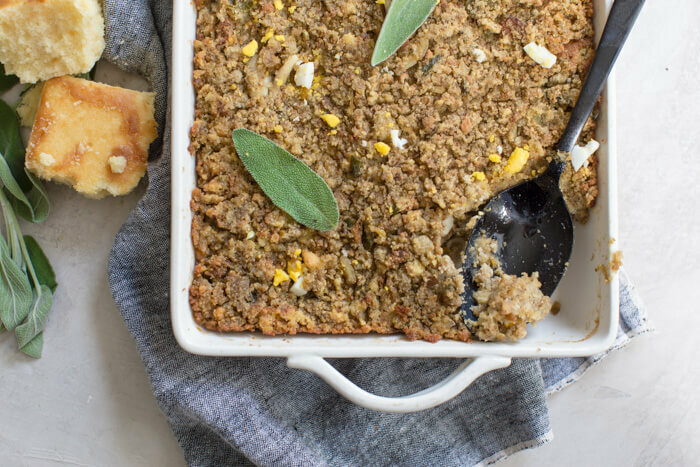 The Ultimate Southern Cornbread Dressing that you want on every holiday table. This recipe is an heirloom from the deep south ya’ll. Happy Thanksgiving week friends! I still can’t believe Thanksgiving is in 2 days. Like HOLY MOLY where has time gone this year? I’m sure each of you have a busy week ahead – and for us between managing the babe’s schedules, holiday travel, and Thanksgiving meal planning, it’s going to be one packed week! But I’m oh so excited for time with loved ones. 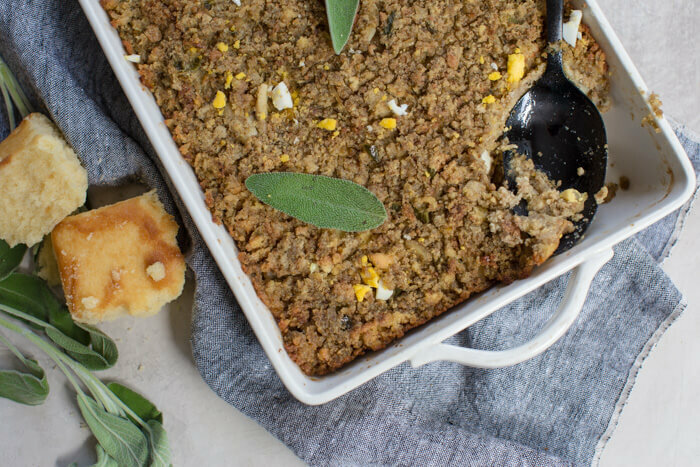 One of the many reasons I love this time of year is because my mom makes her mama’s famous Southern Cornbread Dressing. And I absolutely can’t wait to enjoy it this week. If you’ve been reading this blog for a while you know my mom is a real good cook and homemaker and she learned everything she knows from her mama who raised her as southern as southern gets, twang and all and she has the accent to prove it even though she’s been in Florida since she married my dad way before I was born. 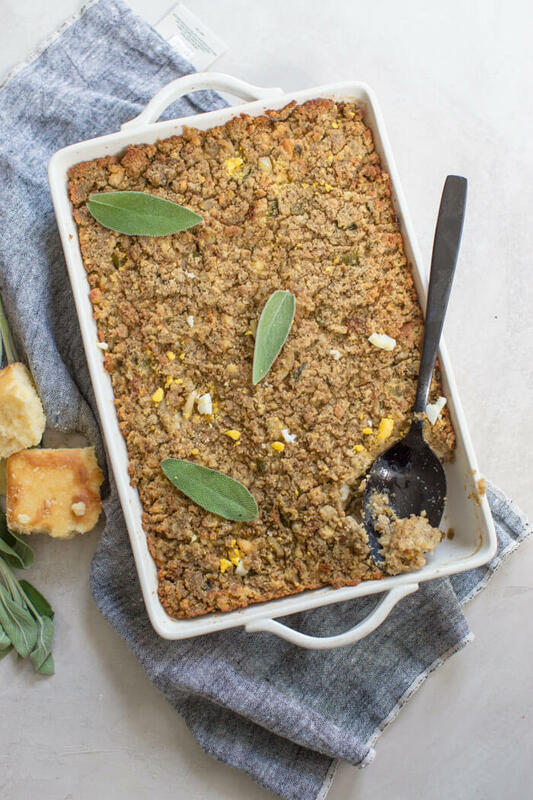 But yes, this recipe is a classic southern cornbread dressing recipe and if you’re wondering it’s “dressing” not “stuffing”, and it’s always made with cornbread, boiled eggs and lots of butter. 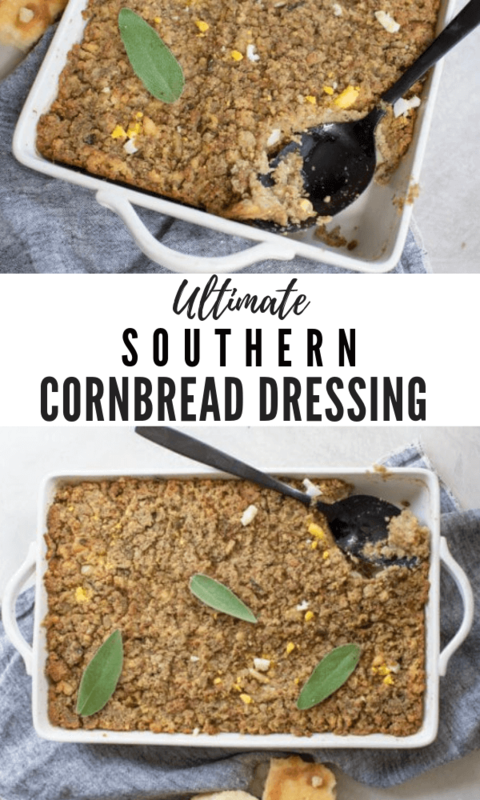 And if you want to know how Southern this Ultimate Southern Cornbread Dressing is, her mama’s original recipe calls for 1 1/2 quarts of “drippins” (and my mom has in her notes “or broth”). And it also calls for 2 sticks of butter!! 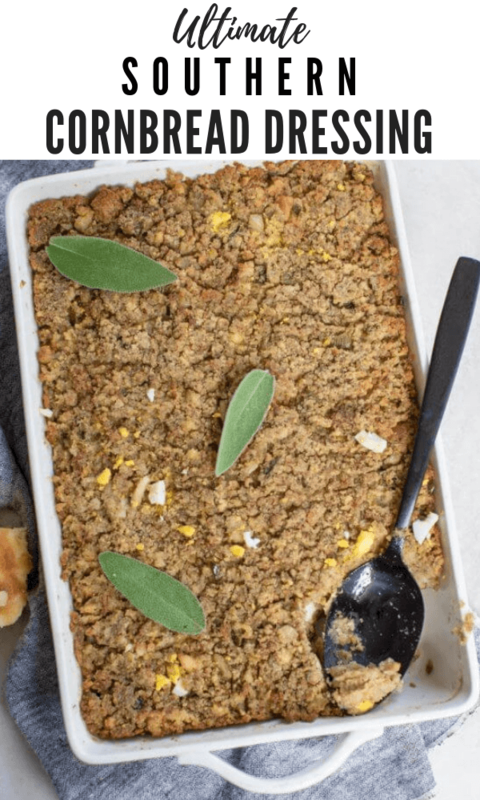 Although she prepares her “giblet” gravy with some of the butter so I opted for 1 stick of butter in this recipe– it pained me a little ya’ll but this makes a big ole mess of cornbread dressing so it’s okay. Thanksgiving and any holiday for that matter can be a little nerve wracking when it comes to food selection especially if you follow a special diet such as gluten free or vegan. 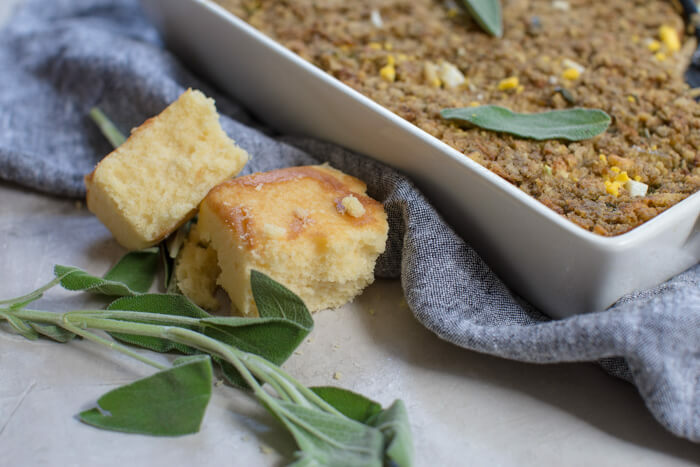 That’s why I’ve created this Southern Cornbread Dressing and included modifications for special diets. 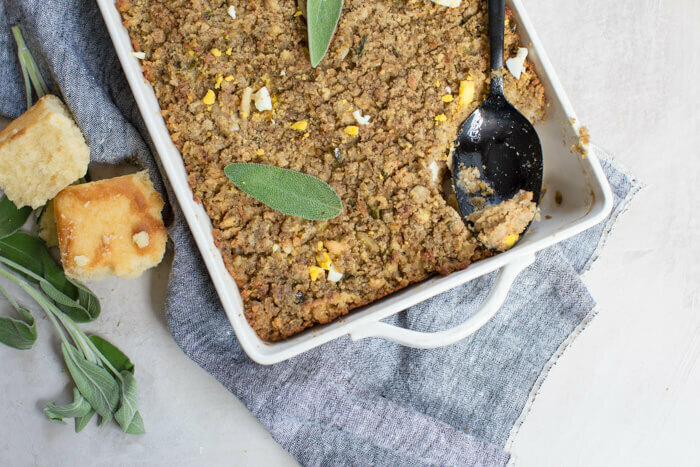 If you love cornbread dressing as much as we all do here down south, you’ve gotta give this recipe a go this holiday season! 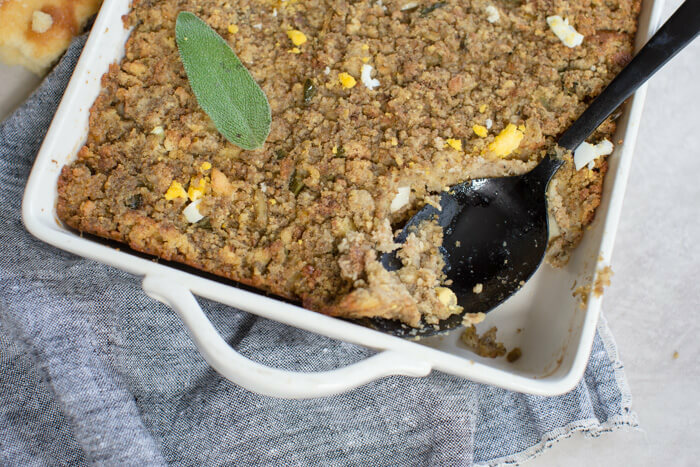 Southern Cornbread Dressing made with hard boiled eggs and Jiffy cornbread mix. 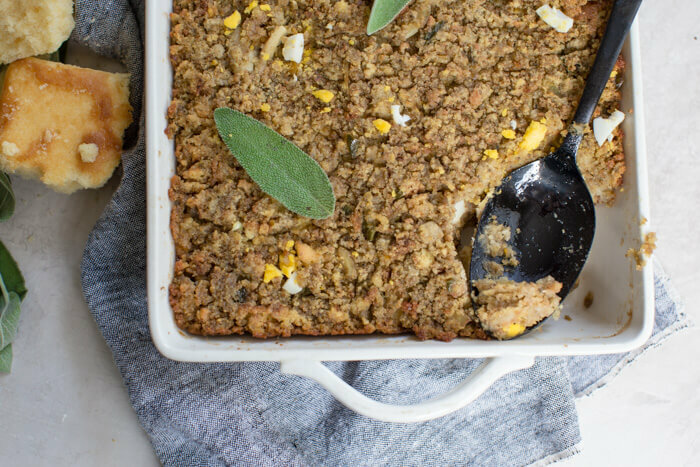 Gluten free and vegan stuffing recipe options. Prepare cornbread according to package directions or if making homemade ensure 9 cups of crumbled cooked cornbread. Once cooked, set aside; reduce oven temperature to 350 degrees F.
In skillet, saute onions, bell pepper and celery in butter or medium heat until butter is melted and veggies are softened. In a very large mixing bowl, crumble cornbread. Add sautéed veggies, stuffing mix, hard boiled eggs, and seasonings to bowl and gently toss to combine. Slowly stir in chicken broth to form a wet consistency. Coat 9X13 inch casserole dish sheet with cooking spray and bake at 350 degrees F for about 60 minutes until golden brown on top. NUTRITION: note that nutrition information is based on Jiffy corn muffin mix and chicken broth. Gluten free and vegan nutrition information may vary. More of our favorite holiday dishes!